Give me a kitchen and I will cook. We eat a lot of eggs. Not only are they good sources of protein, they are extremely versatile. Do you want to bake some cookies? Add an egg. Do you want a casserole type macaroni and cheese? Add an egg to thicken it. Do you want a shiny finish on your pie crust? Brush it with an egg wash. Do you want a fun appetizer or side dish? Devil some. Need to feed a crowd of overnight guests? Make a frittata. Do you want a breakfast that sticks to your ribs? Scramble some. You can always throw some meat and cheese into your scrambled egg, but there is always that occasional morning when you want something different. Here is a dish for one of those different days. My original craving was for Eggs Benedict, but I have not yet mastered the low carb English muffin, so I deviated. I figured out that what I was craving was the Hollandaise Sauce. Although not a traditional, more complicated version of the sauce, it was quick to make and ready in advance of the short cooking time needed for the shrimp and eggs. 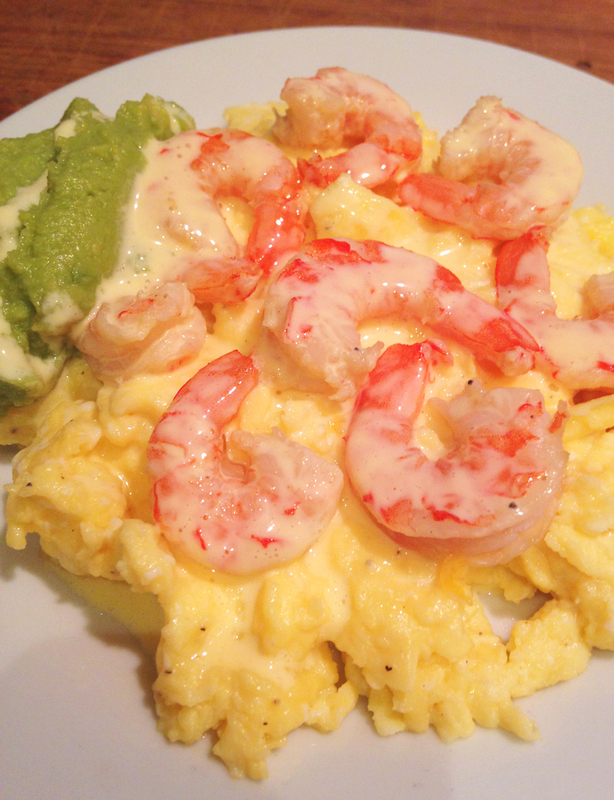 Little B was not very excited about the sauce – she is still young and naive, but she inhaled the eggs, shrimp and guacamole. For the shrimp fill a medium pot half with water. Add salt, squeeze lemon juice into water and drop the lemon half into the water. Set pot over high heat. While waiting for water to boil for the shrimp, make Hollandaise Sauce. Melt 4 ounces of butter and let cool briefly. While butter is cooling add the rest of ingredients in a blender but do not blend them yet. When butter has cooled a bit spoon out the foamy, bubbly top from butter, leaving the clear, yellow clarified portion. Use only the clarified portion for the sauce. Begin blending the mixed ingredients on low and gradually and steadily add the butter. Let blend for about a minute. Stop the blender. Leave sauce at room temperature until served. If water is boiling add shrimp and cover. Let boil for three to five minutes, just until they turn pink all over. Remove from water and place on towel to drain. In a bowl crack the eggs and add salt and pepper. Whisk until combined. In a frying pan melt butter over medium high heat. Add eggs and stir in the pan until cooked to desired doneness (Big D likes soft so I take his out of the pan first – Little B and I like ours a little more firm). Divide eggs among individual serving plates. Top with shrimp, then drizzle them with Hollandaise sauce. Add a side scoop of guacamole and serve.